Demand for homes in the Vale of Glamorgan is high with 1425 people currently registered on the council’s housing waiting list (Homes4U) for a one bedroom home and a further 756 applicants waiting for a two bedroom home in Barry alone. Working in partnership, Hafod, Vale of Glamorgan Council and South Wales based contractor, Morganstone are re-developing the site of the former Barry Docks Cons Club which had been unused and empty since 2014. The building, which was due to be demolished to make way for the new development, was severely damaged following an arson attack in May 2018. Since then work has been underway to prepare the site to allow building work to start. Funded by Hafod and the Welsh Government’s Social Housing Grant and Housing Finance Grant, the 15 one-bedroom and six two-bedroom apartments are due for completion in winter 2019/2020 and will be available to rent. 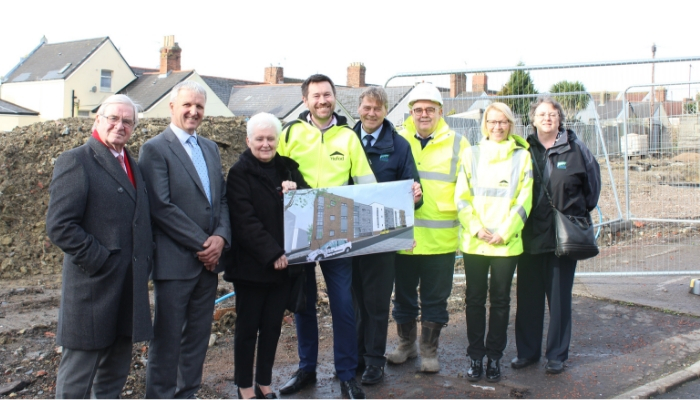 Councillor John Thomas, Leader of the Vale of Glamorgan Council, said: “This important scheme will not only provide much-needed affordable housing for Vale residents in need of it, but also give this site a new lease of life. “We are committed to regeneration projects of this type, those that will bring real benefit to our communities, and are involved in a number of similar schemes elsewhere in the County. The homes will be allocated via the Vale Council’s Homes4U scheme. To find out more please email h4uonlineapplication@valeofglamorgan.gov.uk or call 01446 704840.